She preaches the same sermon I have shared with so many friends and clients – if a photo is important, print it on paper. I was in kindergarten when this photo was taken. It was the night of my first ballet recital. First and last, actually. I decided I didn’t have the patience for ballet, nor ballet for me. The photo was taken right before we headed out the door to a ballet performance on par with a train wreck. But really, none of that matters. What does matter is the man who was holding me in the photo. That’s my dad and when I say I adored him, that doesn’t even come close to saying what he meant to me. He died many many years ago, much too early. And when I look back on our times together, a lot of it is fuzzy, much like trying to remember a dream. Time has a way of erasing details, doesn’t it? And I guess that’s both good and bad. Good in that there are painful things we don’t always care to remember, but bad in that those things that mean so much to us slip so quickly from our minds. When I close my eyes and try to recall the faces of people I loved and lost, I see only the idea of them. But I will always remember the details of my father’s face — the twinkle in his eye, the cleft in his chin, the curve of his jaw. Because somebody cared enough to take and print pictures like this. Somebody put on paper the face of this man I loved and because they did, I have it now, years later, to show my children…to remember. This moment right before my ballet recital is not a vague moment forgotten to the winds of time; it is alive and well thanks to a photograph. So, please, print what you want to preserve; don’t put it off. 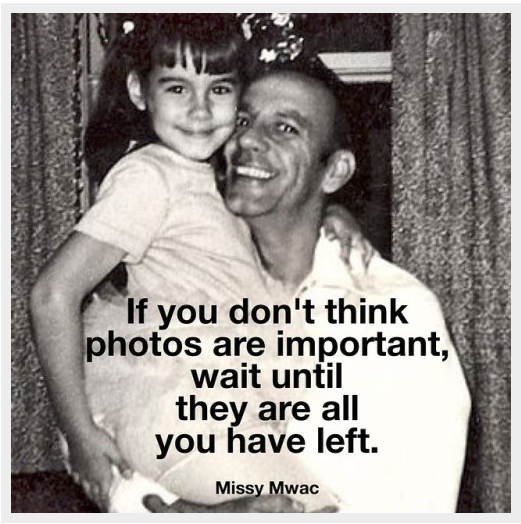 If you don’t think photos are important now, wait until they are all you have left.